We were blessed with a weekend of warm and not too windy conditions. Group size was limited to 14 since house 3 was unavailable. We had a number of new people in the group – some of our stalwarts had already assisted with the petrel feeding and others had dropped out after the previous week’s cancellation. For the first time in at least 2 years we had no-one to lead the gecko monitoring. On Friday night, after a great shared meal, a group went to monitor the fauna present on the 80 flax plants in our flax weevil experimental plot. This needed to be done in the dark, using headlights. Three different weta, goldstripe and common geckos, skinks, slugs, spiders and beetles were amongst the critters found. Back to the Lockwood by around 11pm. The majority went to the flax plot Saturday morning to assist with setting up the pitfall traps ready for monitoring Sunday morning. Will and Colin led this work. The two stayed on at the site for the remainder of the day attempting to establish an even water flow to all the flax plants in the irrigation line. Jaz and Basil focussed on removing the waratahs from the green gecko fence. They were later assisted by Peter and David. Lots of muscle and great application of the laws of physics won out. Jaz finished off by barrowing the waratahs down to the shed. Tania and Heather travelled to the flax planting sites around the plateau, monitoring plant health/survival. The plantings near the bird feeding/flax weevil release site and at the head of Hole in the Rock Valley will probably be closed down due almost complete destruction by flax weevil and dry conditions. 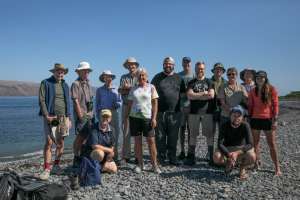 Dale, Anne, Edwina and Susannah visited the caravan where Cathy and Helen Sharpe were feeding the remaining 5 white faced storm petrel chicks. Helen Gummer had come over for the day. Cathy and Helen spent time identifying spots the petrel burrows can be sited this coming winter. Very helpful. Richard continued with convolvulus removal in the wetland. He was assisted there as others completed their tasks. Others worked on trail clearing. The flax site pitfall traps were opened and the contents recorded by a smaller group Sunday morning. The traps are closed until our next visit. Five of us revisited the caravan area to begin clearing undergrowth in preparation for white-faced storm petrel burrow installation. Colin and Will persevered with sorting the irrigation. Trail clearance, wetland weeding, tube removal from successful flax planting were among the jobs completed before the return to the Lockwood to clean up and head down to the boat. It was great to have newbies on the trip. There were 3 guided trips which coincided with our visit. Geoff and Dallas were rangers in place of Nick and Gen for the weekend.